I got a tattoo about a year ago on the crown of my head. love it, but am having worries about it because I am starting to lose my hair and soon it will not be something that is 'just for me'. 6" diameter/very colorful. Money is not a factor. Does the tattoo removal procedure actually erase your tattoo completely? Can Microderm work to get rid of my scar which was left from having a tattoo removal? I had a large tattoo removed by laser several years ago and the skin is still quite scarred, with some hyperpigmentation. Could microderm treatments work to correct the skin, or fraxel? Free tattoo removal for joining the Navy? I was told that I could get a tattoo removed for free because I want to join the Navy. Is this true? Recommendation to fade a half sleeve? I have a half sleeve of colorful vines and such. I want to fade it to a point where I can tattoo over it. What do you recommend? Is it possible to remove Tattoo Eyebrows by Laser Tattoo Removal? I tattoo my eyebrows three years ago. They were to be brown, but turned out to be ashing in color. I would like to have them removed by laser. How many treatments are needed? 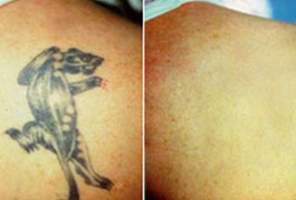 What is Rejuvi Tattoo Removal? Is this a hoax? Is it widely offered?